I first posted this Final Fantasy themed article about 2 years ago. Since then I've found a bunch more fantastic Final Fantasy themed models. Rather than make a second post I've decided to update this one with all the new models. Enjoy! There's a ton of really awesome video game themed origami out there that I haven't really seen highlighted much. Therefore I'm starting a series all about video game origami! This first part is all about Final Fantasy themed origami. I'm a huge fan of the Final Fantasy series and a lot of these models are quite awesome. Satoshi Kamiya has also designed a great origami Chocobo and I totally bought his book Works of Satoshi Kamiya 1995-2003 just so I could have the diagrams for it. Satoshi Kamiya also has a picture of an adorable baby Chocobo in his book and Gonzalo figured out how to fold it. Here's one more completely different Chocobo design by Mathieu Gueros. The design of Chocobos changes slightly with each Final Fantasy game and this particular one really looks like the ones from Final Fantasy V I think. After all these chocobos it's quite fitting to have this Chocobo Eater. The Chocobo Eater is a boss from Final Fantasy X that's causing trouble for some Chocobo owners. Hyun Seok Kang perfectly captured it here, especially the round body and mouth. Amazingly enough this is folded from a simple Bird Base. Here's another boss monster, this time from Final Fantasy IV. This next model is a bit more obscure, this is a monster found in Final Fantasy XI which is pretty much the only Final Fantasy I haven't played so I didn't recognize this at first. This is folded from one square of paper! The Final Fantasy series has several different classes that usually have a similar and distinct costume design. Hubert Villeneuve designed this fantastic White Mage and the paper he used captured the white and red pattern you usually see on White Mages perfectly. Hubert Villeneuve later designed this second version of his white mage and it's absolutely incredible. This is folded from a single square of paper and the colour changes here are astonishing! I really love the pose of this model too. The hood can apparently be folded down too which is a very nice touch. The Malboro is a very powerful enemy found in most Final Fantasy games. It's got a very complex design and it's very impressive that people were able to fold these with origami. Tadashi Mori designed a great origami Leviathan and even made a video tutorial showing how to fold it. Here's another artists excellent take on the Hydrean as it's referred to in Final Fantasy XV. Sephiroth, the villain from Final Fantasy VII is one of the most iconic characters in the entire Final Fantasy series so of course someone designed an amazing looking origami version of him. 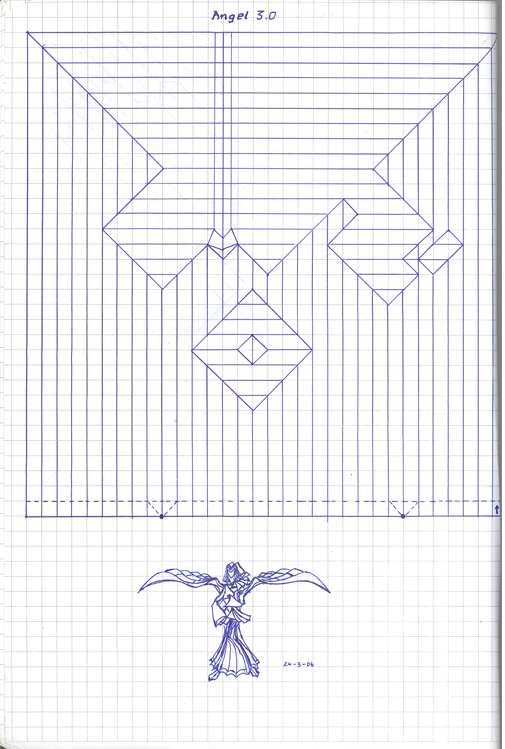 The Divine Dragon Bahamut might be the most famous summon from Final Fantasy and Satoshi Kamiya has designed a really awesome origami one. This model started out as Son Byeong Hun's devil (2014 version) but Hyun Seok Kang altered the structure and the shaping to turn it into Bahamut. Next we have this incredible model of Bahamut Fury from Final Fantasy VII Crisis Core. This is folded from 15 squares of paper. Our "Final" model for this post is another Bahamut design and this one is absolutely incredible. Hyun Seok Kang started with Satoshi Kamiya's Bahamut design and over a period of several weeks he designed this amazing version 3.5. It's version 3.5 because Satoshi Kamiya has a version 3.5 of some of his other super complex designs such as his Ryujin and Phoenix. The original plan was to make the Final Fantasy X version of Bahamut but the weird disc thing on it's back ended up being too difficult to incorporate into the design. In the end though everything about this model is amazing, especially the details on the wings and the scales. That's it for this post let me know which one of these Final Fantasy origami models was your favourite in the comments. And if you just want to talk about Final Fantasy in general in the comments feel free to do that too! I'm a huge fan of Pokemon and we've made several posts in the past about paper Pokemon. This time I've put together a master post of as many Pokemon that I can. I had originally planned to put every single one that I've seen together in this post however there were just too much. I had to scale things down and went with just one image per Pokemon. Because of this in this post we're going to feature the single best version of each origami Pokemon. Whether that be an image or a video. We haven't quite managed to catch them all but we did put together about 100 of them which is quite an impressive amount. Kakami Hitoshi is the first Pokemon designer I ever saw. He runs a website called Calico's Origami Aquarium where you can find all his Pokemon models. Plus he has lots of other animals and especially origami fish. Henry Pham runs a fantastic YouTube channel with lots of video instructions for folding Pokemon. He has video instructions that show how to fold the best Eeveelutions I've ever seen. I've even folded a few of them myself. Paper Ph2 (I unfortunately don't know their real name) runs another really great YouTube channel with tons of video instructions for origami Pokemon. You'll see all four of these artists come up lots of times throughout this post. Generation 1 is arguably the best generation when it comes to Pokemon designs. This is also reflected with the number of different origami designs there are. You'll see there are way more Generation 1 designs than any other generation in this post. Tadashi Mori definitely has my favourite Charizard design. It's pretty complex and not easy to fold though. Henry Pham has designed each of the original starter Pokemon. Here's a tutorial for his Squirtle. Finishing our the original generation starters here's a tutorial for a Blastoise. Kakami Hitoshi designed this fantastic Pidgey. It's not a complex design but it looks really great, especially if you use brown and white paper. Here's another really great design that's also not too complex but still looks really great. There's a ton of different origami Pikachu designs out there. For this post I've picked what I think is one of the more unique looking designs by Ivan Danny Handoko. Here's a pretty adorable little Vulpix design. I especially like the shape of the head. He's also designed a pretty fancy looking Ninetails as well. And here's a great Venomoth design to go along with the Venonat. Here's a really great Psyduck design. Remember to use yellow and white paper and you'll get perfect colour changes on the face. And here's the evolved form of Psyduck, Golduck. This Geodude design is absolutely fantastic! I'm very impressed how much it looks like a Geodude, especially since that's a really weirdly shaped Pokemon when you think about it. Here's a really cute Ponyta design with an excellent colour change in the design. It looks really great if you fold it with red and white or orange and white paper. Next is the evolved form Slowbro. The twist pattern on the shell is really nice, especially if you use white and pink paper so you get the mixed colours. It's a great seashell design. There are a few different Gengar designs but in the end I had to go with this one by Paper Ph2. It's not too complex and looks excellent. Here's another fantastic design from Kakami Hitoshi. This Voltorb isn't too difficult to fold so it's a great model to try if you're an origami beginner. Here's a really great Tauros design, especially the tails. There are a couple of really great Gyarados designs out there. Henry Pham has a really good one but for this post I had to go with this fantastic design by Kakami Hitoshi. It's not too complex but it still has tons of details and really captures the ferociousness of the Pokemon. Here's a really great Lapras design. I love how the shell on the back is a different colour. As mentioned at the start of this post, when it comes to Eeveelutions Henry Pham has some of the best designs. He's also nice enough to share them with these excellent video tutorials. I've tried folding them myself and they're not too difficult. They look really great too, especially the Vaporeon. If you're going to have an Omanyte you of course need a Kabutops to go with it. Here's a great somewhat 3D Dragonite design. Our of all the multiple Mewtwo designs the one by Kakami Hitoshi is the best. The colour change on the tail is fantastic and couldn't have been easy to incorporate into the design. There are a lot of great origami Pokemon from Generation 2 as well. Let's get started with one of the starters. One of the most famous Pokemon from Generation 2 is Togepi so of course there's an origami version of it too. Here's a really great Wooper design. Here's a great little Dunsparce. It's nice to see Dunsparce getting a bit of love. This Skarmory is amazing, especially when it's folded with silver coloured paper like you can see here. This Suicune is definitely one of the best origami Pokemon designs I've ever seen! I really hope one day Kakami Hitoshi designs a Raikou and an Entei too. I absolutely love this Lugia. It's another one of the best Pokemon origami designs I've ever seen. It's all one sheet of paper and the colour changes are fantastic. It took Ji Woo Han 10 hours to fold this one. And of course if you've got a great paper Lugia you also need a great Ho-Oh to go along with it and to wrap up Generation 2. This Ho-Oh uses 8 sheets of paper. We'll start this generation off with possibly the cutest starter, Torchic. Here's quite an impressive looking Gardevoir to go along with the previous Kirlia. Lunatone is not a Pokemon that I would have expected someone to design. Someone did though and it's an absolutely fantastic looking origami Pokemon. Absol is another one of my favourite Pokemon so it's awesome to see a paper version. Here's a really great Relicanth design. This is another excellent example of using a colour change in the design and two-sided paper. Latios and Latias are both excellent Pokemon so of course there are origami versions of both of them. The really great thing is that they're essentially the same design except for the colour. If you use red and white paper you end up with Latias and if you use blue and white paper you end up with Latios (I think I got that right). There are a couple of really great Latios and Latias designs out there so picking one for this post was a bit difficult. In the end I decided on this one which isn't too hard to fold and still looks really great. The colour changes match the actual Pokemon perfectly. Jirachi is another legendary from Generation 3 and I absolutely love this Jirachi design. The 3 little strips of paper might technically be cheating but I don't mind at all. Generation 4 launched on the Nintendo DS in 2008 or 2009 depending on your country. This generation saw a pretty big graphical update and introduced a lot of excellent new Pokemon. Leafeon, another one of my favourite Pokemon is from this generation and we'll see a really good origami Leafeon in a bit. We'll start off this generation again with the fire-type starter. I tend to usually pick the grass-type starter but the fire ones always seem to be the most popular. Lucario is probably the most popular Pokemon from this generation so it makes sense that we'd have an origami version. Leafeon is another one of my all-time favourite Pokemon and I usually have it on my team. In addition to all his other excellent Eeveelution designs Henry Pham also has this awesome Leafeon. I've folded it myself and it's not too hard. You have to use white and green sided paper and for the most accurate look you need to fold with the white side as the dominant side and make the green side the back of the paper. Probopass is a pretty obscure Pokemon but yep, there's an origami version! A YouTuber named Axojisan has designed a great Dialga and Palkia. I've folded the Dialga myself and it's not too hard and looks great. Here's an awesome Darkrai model that uses 2 sheets of paper with a different colour on each side to get the 4 colours in the completed model. Kakami Hitoshi designed one of the cutest paper Pokemon I've ever seen. He's got both the land form and sky form versions of Shaymin. Zorua is one of the most popular Pokemon from this generation so of course there's a paper version. Reuniclus isn't really a Pokemon that I would expect to be that popular but here's an origami version. It's very well designed too. Greninja is arguably one of the most popular Pokemon from this generation. Here's a great tutorial showing how to fold a paper one. Henry Pham also designed this amazing Sylveon. The design is pretty amazing and even has those ribbons. Unfortunately there's no tutorial for it yet so all we have is this video demo of it. This Yveltal is easily another one of the most impressive looking origami Pokemon I've ever seen. It's folded from a single sheet of paper. If you use a sheet of black and red paper you end up perfectly matching the colours in the actual Yveltal design. Pokemon Sun and Moon just came out so there hasn't been a lot of origami designed from these games yet. YouTuber st te though has created video tutorials for the main two legendaries from each of the games. Wow, that's a lot of origami Pokemon! We'll probably keep updating this post into the future too as we see more. In the mean time, let us know which one of these is your favourite in the comments. If you fold any of these feel free to share a photo of it with us too. We'd love to see! There's pretty much no limit to the kind of people you can fold out of paper. There are origami knights, dancers, famous people and lots more. This post is a collection of a bunch of completely un-related different origami people. We'll start out with this brutal knight. The whole model is folded from one sheet of paper and instead of folding a shield like in the original design Lucas Honor folded the head of an enemy. Taking a complete tonal shift next we have this excellent paper ballerina. Hoang Trung Thanh designed this great emperor. The entire model is folded from one sheet of paper and if you use two coloured paper you get different colours on the clothes. This amazing model of a Roman soldier on a chariot is folded from a single sheet of paper! Next we have this bride and groom. Each one is folded from three 5 Euro bills. Hubert Villeneuve designed this incredible prisoner. I'm pretty sure the whole model is folded from one sheet of paper. Here's an awesome paper swordsman. This model is La Tapada Limeña which is what the Lima women were called after the Spanish conquered Peru. They wore a dress down to their feet and a cloak that covered their face. The clothing connoted sensuality, mischief, coquetry and seduction which is communicated very well in this model. This is an origami version of Leonardo da Vinci's famous Vitruvian Man. This model, including the shapes around it is folded from a single sheet of paper! Here's a very impressive mother and child. I love the colour change in this model plus the entire person is a single sheet of paper! The suitcase is a second sheet of paper though. This next model of Bruce Lee is absolutely incredible. The entire thing is folded from one sheet of paper. I really like the fighting pose he's in here. Here's an awesome and very expressive paper grandpa. This is another absolutely incredible design from Hubert Villeneuve. It was designed for the International Origami Olympiad III challenge and the theme of the challenge was peace. The entire model is folded from one sheet of paper. Here's another Roman soldier this time fighting on foot. And here's another different style of an origami knight. Knight, Designed and Folded by Wasun N.
I've seen a couple of different samurai designs and this one is one of my favourites. Joseph Wu designed this excellent archimage. This next model is very unique and I haven't seen anything else quite like it. Here's another absolutely fantastic paper dancer. Everything here is folded from the same sheet of paper. If you look closely you'll see a flower pattern on the sides of the head. Here's a very impressive taoist priest model. This model again is folded from a single sheet of paper. Our final model for this post is an amazing origami version of Michelangelo's Pietà sculpture house in St. Peter's Basilica in Vatican City. That's it for this post. Which one of these models was your favourite? Let us know in the comments and be sure to visit these amazing artists and let them know you think their work is awesome. Surprisingly enough there's a lot of great origami inspired from Pixar, Disney, Dreamworks and other animated movies. Pretty much anything that people like can be used to inspire origami artists. We'll start this post off with a pair of origami Minions and each of them is folded from one sheet of paper. Eyal has taken Quentin Trollip's excellent panda design, gave it a staff and turned it into a Kung Fu Panda. Here's a fantastic origami version of Maleficent from Sleeping Beauty. Nguyen Hung Cuong's Chef Rat is a perfect papercraft version of Remy the Rat from Ratatouille. Frozen is an incredibly popular movie so of course there's an origami Elsa. Here's another excellent origami model from the Kung Fu Panda movies. Here's a quite amazing Jack Skellington to go along with the paper Zero from earlier in this post. Fernando Gilgado's Scrat is a very popular origami model. Here's this model again from several different angles. The entire model is folded from one sheet of paper. we couldn't make a post like this without including Brian Chan's fantastic origami Wall-E. Here's another fantastic Baymax designed by 晓 陈. Here's an awesome paper Dronkey from the Shrek movies. Here's one more awesome Baymax design this time by Ivan Danny. That's it for this post. There are tons of different topics and types of origami we could post about in the future so if there's a specific type of origami or model that you'd like to see featured let us know! During my origami related research I've come across some pretty cool designs for some Zodiac themed models. There are a lot of cool Capricorn designs as well as great designs for some of the other more uniquely designed signs like Aquarius, Virgo, Sagittarius and Gemini. I decided to collect these together and put together a Zodiac themed post. We have to include all 12 signs though so I guess some of this origami technically isn't specifically horoscope themed since some signs are just things like animals. All of it is pretty awesome though so check it out! Aries is represented by a ram and I found two excellent paper ram designs, one by Seth Friedman and another very popular design by Satoshi Kamiya. Ram, Designed by Satoshi Kamiya and Folded by Eyal R.
There are lots of great bull designs that can be used for an origami Taurus. Here are two of my favourite ones that look especially powerful and aggressive. I was only able to find one model for a paper Gemini but it's a very impressive one. The entire thing, both of the twins is folded from a single sheet of paper! This sign is a bit of a cheat again since it's just represented by a crab. We've already done a post featuring tons of origami crabs but here are a few more excellent ones. This is another easy sign since it's a Lion so here are a couple of my favourite origami lions. Virgo is where things start getting interesting again and Yoshimasa Tsuruta has designed two very beautiful origami Virgo models. It was a little bit difficult to find an origami Libra. Sergey Yartsev has designed a great simple libra and as far as I know this is the only origami Libra model that exists. Neelesh K. designed an incredible Lady Justice model and since she's holding a set of balances and the model is awesome I decided to include it here. Also, here's a piece of trivia. In case you ever wondered why pounds is abbreviated as "lbs" it's because the "lb" is from Libra and the balance scale things. Lady Justice, Designed and Folded by Neelesh K.
Scorpio is another sign that's a bit of a cheat since it's just a scorpion so here are two awesome origami scorpions. Scorpion, Designed by Tadashi Mori and Folded by Mariano Zavala B. As far as I know there's only one origami Sagittarius model designed by gabrixx_. I've seen lots of origami centaurs and lots of origami archers but only one centaur archer. This is where the paper Zodiac starts getting very interesting because there are several great Capricorn designs. Several Vietnamese origami artists, Hoang Trung Thanh, Dong Viet Thien and Nguyen Nam Son designed their own quite complex Capricorn designs. Kade Chan also designed a great papercraft Capricorn that's a bit less complex and always reminds me of the Mozilla Firefox logo when I see it. Aquarius is another interesting sign. Hojyo Takashi has designed the only paper Aquarius that I know of and it's a fantastic design. The model uses a tessellation for the water being poured out and the entire thing is folded from one sheet of paper. Aquarius, Designed by Hojyo Takashi and Folded by Eyal R.
Pisces is another sign that can simply be made with two paper fish but I haven't seen too many people put together an origami pisces. Dzmitry Lysiuk made a great Pisces photo with two origami koi and Sergey Yartsev designed a pretty neat Pisces model where both the fish are folded from the same sheet of paper. That covers all 12 signs of the Zodiac, let us know which model is your favourite in the comments and be sure to check out all of these amazing artists on their Flickr accounts as well. If you're a fan of super heroes then you'll definitely want to check out some of the origami in this post and yes, I realize that a lot of these are DC characters but "marvel-ous" was the best pun I could come up with. First up is this great little origami Captain America. Here's a fantastic origami Ironman, the entire model is folded from one 50x50 cm sheet of paper. Here's a cool origami Thor design. If you use two coloured paper you get a different coloured cape. Here's one of the more popular origami Batman designs by Ángel Morollón Guallar. This is another excellent Ironman design that's also completely folded from one sheet of paper. Here's a great origami Spiderman complete with some origami spiders. Spiderman, Designed by Juanfran Carillo, Spiders Designed by Manuel Sirgo, all Folded by Eyal R.
Here's another great origami Ironman. This is another excellent Batman design by Jackie Yang. Here's a very angry looking origami Hulk. Here's another excellent unique design of the Dark Knight. Neelesh K has designed some incredibly complex origami superheroes like this Catwoman and the entire model is folded from a single sheet of paper, even the whip. Catwoman, Designed and Folded by Neelesh K.
Quentin Trollip has designed a couple great origami versions of different super hero logos. Ironman is definitely one of the most popular superheroes among origami designers. Here's a modular Ironman design folded from 6 sheets of paper. Here's another great origami Batman. This is Juanfran Carrillo's Captain America model again this time folded by the designer himself. Hubert Villeneuve designed this amazing origami Superman from a single rectangular sheet of paper. If you use two coloured paper like he did here you get different colours on the cape boots and belt which looks awesome. This isn't a superhero exactly but it's a vehicle used by one. This is the Bat from the movie the Dark Knight Rises and it's quite an impressive design. And here's a paper version of the Batmobile from the Tim Burton Batman films. Here's another absolutely incredible design from Neelesh K. This entire model including the gun and the skull is folded from one 80x80 cm square of paper. Joker, Designed and Folded by Neelesh K.
Here's Juanfran Carrillo's excellent origami Spiderman again, this time by itself. Here's another folder's interpretation of Brian Chan's Ironman. Hubert Villeneuve invented his own origami super hero called The Sparrow. This entire model is folded from the same square of paper. Here's a slightly different looking version of Ángel Morollón Guallar's Batman. Here's a simpler but still great origami Superman design. It looks to me like he's diving to protect someone from a bullet. Here's the origami Thor from earlier folded by the designer themselves. The final image for this post is one of the most impressive origami models I've ever seen. This Batman by Neelesh K. is folded from one single 75x75 cm square sheet of paper! Batman, Designed and Folded by Neelesh K.
That's it for this post, let me know what you think about these models in the comments and be sure to post a link to a photo if you try to fold any of these! The land of Middle Earth created by J.R.R. Tolkien and made famous through the Lord of the Rings and the Hobbit books and later movies is full of fantastic characters and creatures. Therefore it makes sense that the origami community has created amazing works of origami based off of this world and it's inhabitants. The Nazgul, Ringwraiths or Dark Riders from the Lord of the Rings are very iconic and make for a fantastic origami model, especially if they're folded using evil looking dark black paper. This Nazgul is designed by 晓 陈 and the entire model uses one sheet of paper. It also looks great no matter what colour of paper was used. Jason Ku designed what's probably the most famous origami Nazgul design. The next several photos are all his design but it's very interesting to see how the model takes on a very different look and feel depending who folds it. I absolutely love the pose Matthew LaBoone folded this Nazgul in. Here's a great origami version of Gandalf riding into the battle at Helm's Deep in the Two Towers. Eric Joisel designed another great Gandalf model and Jordan Langerak was able to refold it himself just by looking at a photo of it! Hosanna Tan designed an amazing origami Tauriel. Tauriel is the female elf that was added into the Hobbit movies. The entire model including the bow and quiver is folded from one sheet of paper. Ents are the living trees from the Lord of the Rings. Just like the ents in the story come in many different sizes and shapes, so do origami Ents. Hubert Villeneuve designed this elegant looking female elf. Leo Lai designed some great origami versions of some of the main Lord of the Rings characters. Finally we have this incredible origami Smaug from Kei Watanabe's display at the Origami Tanteidan Convention. Be sure to check out all of these great origami artists if you enjoyed their work and let them know how awesome their origami is. Also be sure to share this post on your social media if you enjoyed it. It really is a huge help. Which one of these models was your favourite? Let us know in the comments. I've always been a fan of Greek mythology and I was pleasantly surprised to discover that there is a lot of amazing origami that's right out of Greek myths and stories. The basilisk is called the King of Serpents and is said to be able to kill you just with one look. Other stories say that it's so poisonous that it leaves a trail of venom in its wake. Fortunately look at or folding this excellent origami Basilisk won't horribly poison or kill you. The griffin is one of the most famous creatures to come out of Greek mythology with the body, tail and back legs of a lion and the head and wings of an eagle. Some people believed the griffin was the king of all creatures and some people believed they guarded priceless treasures. The minotaur is another famous creature from Greek myth with the body of a man and the head of a bull. The minotaur lived in the center of a labryinth that was designed by Daedalus and Icarus for King Minos of Crete. The minotaur was eventually defeated and killed by the hero Theseus. Pegasus, the winged horse is probably the most famous creature in Greek mythology. Icarus was the son of Daedalus and is famous for flying too close to the sun using wings his father created out of feathers and wax. Because of his hubris he flew too high and the sun melted his wings causing him to crash into the sea. The Winged Victory of Samothrace is a marble statue of the goddess Nike who is the the Greek goddess of victory. If you can’t make a trip to see it in person at the Louvre in Paris you can try to fold this origami version. The Hippocampus is a mythological creature with the upper body of a horse and the lower body of a fish. Harpies are female monsters with the body of a bird and the face of a woman. Their name means "snatchers" and they often steal food from their victims. Centaurs are another famous mythological creature with the upper body of a human and lower body of a horse. This centaur is folded from a single sheet of paper except for the bow and arrow. Cerberus is the famous three headed dog that guards the gates of the underworld preventing the dead for escaping. Daedalus was the father of Icarus and was also a skilled craftsman and artist who built the labyrinth where the minotaur lived. Here's another excellent photo of Hojyo Takashi's origami Icarus. Sirens were beautiful sea creatures that lured sailors with beautiful music causing them to crash their ships into the rocks. Here's a cute baby griffin design by Riccardo Foschi. Poseidon is one of the 12 main Greek gods and was the god of the sea. He is also known for causing earthquakes. Here's another excellent origami Cerberus, this model is folded from on sheet of paper. Here's another different and beautiful Pegasus design by Hoang Trung Thanh. Mariano also folded Román Díaz's excellent origami Hippocampus. Here's another amazing Griffin design, this time by Kade Chan. Here's a great "good" variation on Satoshi Kamiya's Minotaur although it has the same kind of creepy feel that a lot of João Charrua's models have. Here's a different and slightly cuter origami basilisk designed by Yery J. Astroña. A Sphinx is a deadly creature with the head of a human, the body of a lion and the wings of a bird. It asks riddles and if one cannot answer correctly they are killed and eaten. The Sphinx is famous from appearing in the story of Oedipus. Our final model this post is this incredible griffin by Kade Chan. There's still a ton of awesome origami from Greek mythology that I'll be sure to post in the future. In the mean time be sure to check out all these great artists on Flickr and if you enjoyed this post please comment and share on your social media. In addition to Final Fantasy Square Enix also has another number of popular video game series like Kingdom Hearts or Dragon Quest and lots of people have made origami models from these games. First up are some Kingdom Hearts themed models starting with an origami version of the character Axel. There are also some origami heartless which are enemies in the Kingdom Hearts series. Dragon Quest is another popular Square Enix series that people have developed origami from. Culex is a secret boss character in one of my favourite games, Super Mario RPG. Hubert Villeneuve designed an incredible Culex from just one sheet of paper. You can't have a series about video game themed origami without mentioning Nintendo. Mario is probably the most famous video game character ever and of course there's some Mario themed origami. Jo Nakashima designed a series of origami people and made paper printouts that if you fold them you end up with Mario characters. Juston has designed a great origami link from the Legend of Zelda series. This is a really cool model. In The Legend of Zelda Majora's Mask you have to stop the moon from crashing into the planet. The moon has a giant creepy face and Morisue Kei designed a great origami moon. And finally we have another really popular Nintendo character in origami form, Samus Aran from the Metroid series. That's it for another episode of video game themed origami. Next time we'll cover League of Legends and DOTA 2 themed origami so be sure to check back again for that.